RHINOPLASTY is surgery to reshape or reconstruct the nose. When used for cosmetic reasons, the purpose is to enhance facial harmony and the proportions of your nose. When used to repair structural defects it can correct impaired breathing. Your nose size in relation to facial balance. Your nose width at the bridge or the size and position of the nostrils. The profile of your nose with visible humps or depressions on the bridge. A nasal tip that is enlarged, bulbous, drooping, upturned or hooked. When considering nose surgery, keep in mind that everyone’s face is asymmetric to some degree. Results may not always be completely symmetric, although the goal is to create more facial balance and more commonly a correct proportion. As with any plastic surgery, it is extremely personal. In consultation with your doctor you will need to decide if the potential benefits will achieve your goals and if the risks and potential complications of rhinoplasty are acceptable. Depending on what you are having done, rhinoplasty surgery may be performed in an office-based surgical facility, outpatient ambulatory surgical center, or a hospital. 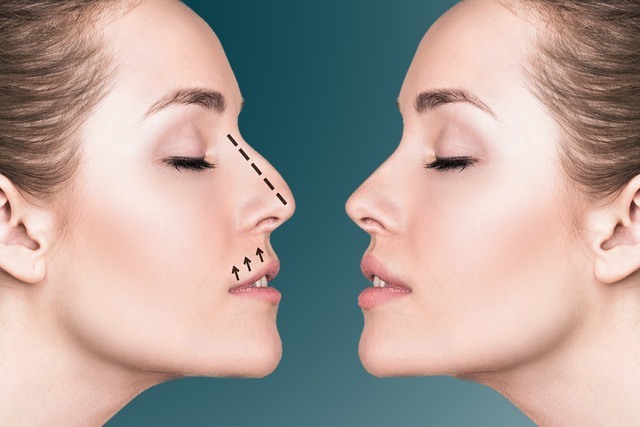 Most commonly known as a nose job, rhinoplasty is a surgical procedure that focuses primarily on changing the shape and look of the nose, not only for aesthetics, but also to correct its function that may have been caused by trauma or a birth defect. How old must I be in order to get a rhinoplasty? Nasal growth is a factor to consider in knowing when one can get a nose job performed. For girls, nasal growth should be completed at age 15, and 16 for boys. How long does recovery from a rhinoplasty surgery take? During the first week after the rhinoplasty procedure, patients are advised to rest in order to hasten the recovery process, as well as minimize the bruising and swelling. Those who do desk work, should be able to go back to work within this time. However, for patients whose job requires high impact activities, an additional two to three weeks should be allotted before returning to work. What can I expect after undergoing rhinoplasty? As soon as the swelling and bruising goes down, the results from a rhinoplasty should be visible. Breathing through the nose might be a little difficult in the first three weeks but everything should be good after that.